Eva created this painting in August 1995, after a vacation with her mom in Nova Scotia. While there, Eva was just fascinated by the meteor showers she saw. On the very last night of her vacation, Eva's cousin Walter, took Eva to Cape John. They both sat and gazed for hours at the magnificent shooting stars in the sky. After the vacation, Eva created this painting of the place where she and Walter had sat viewing the sky. Eva then gave this painting to Walter as a "thank-you" gift. 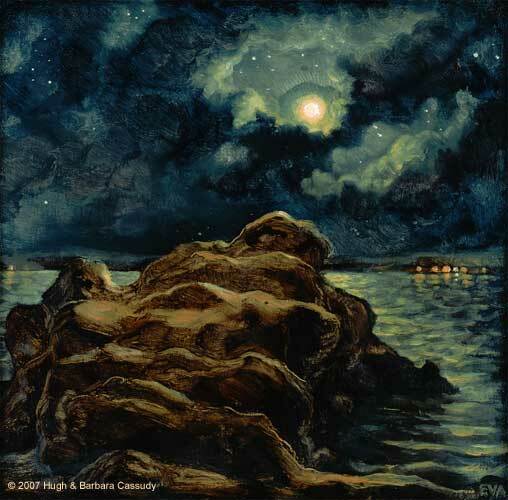 10" x 10" (including a one-inch border on all sides); a fine art giclee print, reproduced on German etching paper; numbered and signed by an immediate Cassidy family member; "Certificate of Authenticity" with each print.